Located near downtown San Antonio , Metropolitan Methodist Hospital is a 316-bed hospital providing a complete range of health care services in San Antonio and the many neighborhoods and businesses that border its centralized location. Easy freeway access makes Metropolitan Methodist Hospital convenient for patients, visitors and physicians to access from all parts of the city. In 2005, Metropolitan Methodist Hospital opened the new Metropolitan Methodist Hospital Women s Pavilion, the only facility in downtown San Antonio completely dedicated to the health of women and their newborn babies. 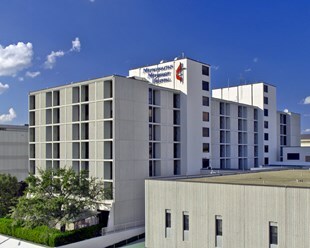 Metropolitan Methodist Hospital offers outstanding cardiac care, general and surgical care, behavioral medicine, neurosurgery, inpatient and outpatient rehabilitation services, sleep disorders evaluation and the largest emergency department in downtown San Antonio. Dec. 8, 2017: Highlighting its nationally recognized achievements in patient safety and quality, Metropolitan Methodist Hospital, a campus of Methodist Hospital, was named a Top General Hospital by The Leapfrog Group. This is the first time that a San Antonio area hospital has been named to the Top General Hospital list since the aware program began in 2006. The Leapfrog Top Hospital award is widely acknowledged as one of the most competitive honors American hospitals can receive. The Top Hospital designation is awarded by The Leapfrog Group, an independent hospital watchdog organization. Methodist Healthcare System – San Antonio is the largest provider of health care in South and Central Texas with 28 facilities including nine acute care hospitals serving over 94,000 inpatients and 500,000 outpatients annually. The System team is comprised of 11,000 employees, making Methodist Healthcare System the second largest private employer in San Antonio. The Texas Quality Foundation selected Methodist Healthcare System to receive the 2014 Texas Award for Performance Excellence, making Methodist the first and only health care system in South Texas to receive this award, which requires an organization to demonstrate its commitment to the highest quality standards. With more than 2,700 credentialed physicians, Methodist Healthcare System provides the largest array of medical services in the region including neurosurgery, cardiovascular services, transplants, oncology and women’s services. The health system is equally co-owned by both HCA Healthcare and the Methodist Healthcare Ministries. HCA Healthcare is one of the nation’s leading providers of healthcare services, comprising 178 hospitals and approximately 1,800 sites of care, including surgery centers, freestanding ERs, urgent care centers and physician clinics in 20 states and the United Kingdom. Methodist Healthcare Ministries of South Texas, Inc. is a private, faith-based not-for-profit organization dedicated to creating access to health care for the uninsured through direct services, community partnerships and strategic grant making in 74 counties across South Texas. Visit SAHealth.com to learn more.